Life is not about balance. Life is a jugging act. Most of us have five, ten or 25 balls in the air: work, family, friends, a clean house, laundry, faith, volunteering, business, dreams, hopes, fears, and on, and on, and on. You all know what I’m talking about. We are so overwhelmed by all the things we have going on and all the people who tell us that balance can be achieved if we just try hard enough. I have read lots of articles about achieving the balanced life, yet I don’t see many people doing it. That’s because we all believe that we have to keep everything we have going on in some type of harmonious balance. The house must be clean and organized, the kids fed, the spouse happy, all while working 50 hours a week, starting a side business, building a blog, checking email and Facebook 400 times a day and spending all day Sunday in church. Oh yeah, I’m balanced. No wait, I’m freakin’ tired. Life is a juggling act. We get all the balls in the air and hope we don’t drop one. Can I let you in on another little secret? Sometimes, it’s okay to drop one, maybe two. Be intentional about it. You don’t always have to make an amazing Food Network meal. Grilled cheese and tomato soup is pretty awesome sometimes. Leave the laundry for another day. Shut down Facebook for a day. No one will unfriend you. If you are not intentional about the balls you let fall, they might all come crashing down. It’s okay not to be perfect. It’s okay to juggle the best way you can. 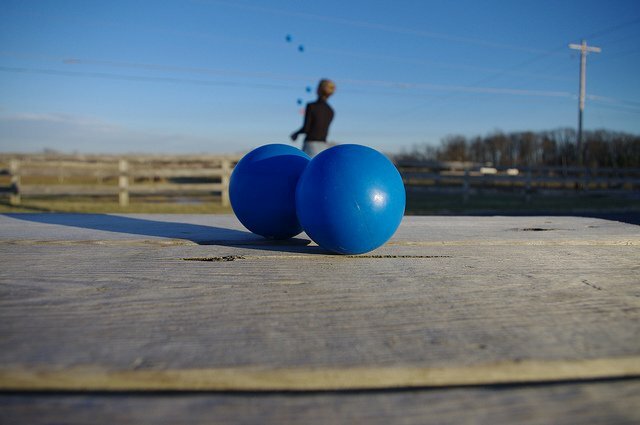 The decreased stress level will make your friends think you have found the mystical magical balance, but we all know juggling looks much more fun.